“Heavy rains and high winds nearly stopped a day of racing at the Ponca City Grand Prix Sunday…thunderstorms drove a spectator crowd of over 15,000 scurrying for trees around the lake area while drivers battled with an oily asphalt road course, spray and driving winds.” – Linda Pavlik , Staff Writer, The Daily Oklahoman, July 7, 1969. It was not uncommon to have rain before or after the races at Ponca City, but in 1969, the skies opened up on Sunday during the races, and the results were truly different from the norm. My last time to drive at Ponca began when my father agreed to let me drive his Volvo 544 (for sale for $850.00). I had sold my bugeye to French Hickman upon entering the Army in 1968, and I was home on thirty days leave before shipping out to Nam. The 544's engine was advertised as “fresh,” meaning that it had been rebuilt, less most of the high performance parts which went into my father’s new racer, an F Production Volvo P1800. I flat towed the 544 behind my Volvo 122S to Ponca and parked it in the paddock next to Dad’s P1800 and brother-in-law John Saucier’s new Titan Formula Ford. ESR (England Saucier Racing) in the paddock. The hero drivers confer in the foreground. Behind them, l to r, are Gene Rolfe, Alan Cadwell, Sandra Saucier, Bert Everhart, Uncle Freddie, and Laura Waller. Practice on Saturday was relatively uneventful, with lots of sunshine. My best lap was 1:20 , which wasn’t too far off my Dad’s best time from 1968 (1:09 as I remember), but I was way slower than my B Sedan competition, Mark Cain and Ray Blitstein, both in Lotus Cortinas. Sunday morning practice was faster, as I cranked off a 1:12.5, but not better as the head gasket blew on lap six. Hurriedly my crew (two college buddies hung over from the Saturday night race party) and I replaced the leaking gasket. In the excitement, Tom twisted off one of the generator bracket bolts, so we had to drill out and replace the bolt. We made it to the false grid and a wonderful thing happened. The skies opened up and it rained like hell. This was wonderful because I had to run on my father’s rain tires, which he didn’t need as his race was earlier and in the dry. These rain tires were unique. A sole proprietor tire re-treader on the south edge of Guthrie had acquired various sizes of Michelin X molds. Dad had him put the Michelin treads on Pirelli Cinturato carcasses. The softer rubber, with the proven Michelin X tread pattern on Cinturato carcasses made excellent rain tires. The green flag dropped on our rolling start (new for 1969) and my years of flagging, installing barrels and just being at Ponca paid dividends. Turn One drains to the inside (towards the lake). In 1969 most of the turn was shaded by large Elm trees, mostly on the outside of the turn. I simply drove around the turn on the outside all the way to the Ranger Station, passing almost every thing in sight, including the two Cortinas. Some of the D Production cars re-passed me on the back straight, but the Cortinas were far behind. I was actually faster than they were in the rain; it was truly the 544’s finest moment. On lap three a terrible thing happened. It stopped raining. By lap six Mark Cain passed me going into the Flatiron. Again experience prevailed and I dove deep onto the grass and re-passed the Cortina on the inside, slinging mud all over Mark’s windshield. He easily got by me before Start/Finish. A couple of laps later Ray passed me too. On lap 10 the water gauge pegged, (faulty mechanics ?) and I made a pit stop for water. Another stop for water on lap 21 and a drive across the line, for third in class (out of 3). In Saturday's action, Bobby Alyward eases his McClaren past Chris Dyer's Camaro going into Turn Two. Photo courtesy Ponca City News. From the front row, Coman and LaPeer traded places for almost the entire race. Once, as they were coming up to lap me for the first time, I saw them in my mirror, side by side, coming out of Turn Two. I hugged the asphalt edge on the inside, braking for the Farmhouse. Ron passed me on the outside at the turn while Dave passed me on the INSIDE, with all four wheels in the grass. Exiting the off camber turn, Ron slide off on the left, Dave re-entered on the right and they both went down the back straight, again side by side. I was lapped two more times by Ron, but only once by Dave, as his black Alfa buried itself in the haybales at the Farmhouse. The other two thirds of ESR (England Saucier Racing), didn’t fair as well as I, however. My father shredded his clutch disc in Saturday’s practice. On Sunday, the Volvo P1800 gear shift jammed in third gear, and George motored to fifth in class. John’s new Titan was no match for the even newer Merlyn of Eddie Miller who thrilled the spectators with a last lap pass of RPMM team-mate Jimmy Pyle, to win Formula Ford. 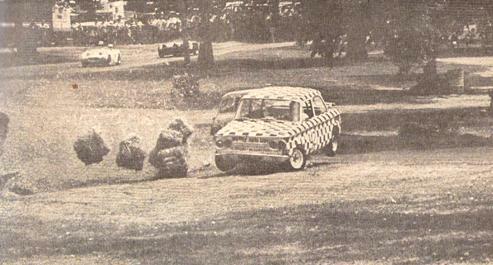 ESR Hero Drivers, l to r: Steve England, John Saucier and George England. In the background are Margaret England, Grandma Tillie and Tonda Rolfe. “In another race, David Dooley, Oklahoma City, failed to lead the pack as expected because his car did not have rain tires.” Linda Pavlik wrote. I disagree with Linda as we watched Dave and his new Triumph GT6 lead the E-Production field until the rain started. Braking into the Flatiron, Dave could barely be seen inside his coupe because of the fog on the windscreen and windows. He was frantically trying to wipe the windshield while braking and down-shifting, but he couldn’t reach it because of his safety harness. He quickly ducked into the pits, the Carter Maxwell crew cleaned the windows and Dave re-entered. A lap later the fog came back and Dave quit for good. Don Yenko leads the Big Iron past the Farmhouse in Saturday's race. Photo courtesy Ponca City News. It began raining on the false grid, and both Alyward and Parkill stayed in the pits. 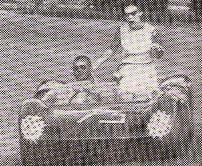 Yenko and Dooley motored around just fast enough to place first and second in A Production. A Sedan was another story, however. Waco had jumped McComb on the start, but when they crossed the line on lap two, McComb eased by Waco, who reacted by nailing the throttle to stay ahead, spinning into the inside of Turn One, bouncing through the mud, finally stopping just a few feet from the outhouse; DNF. 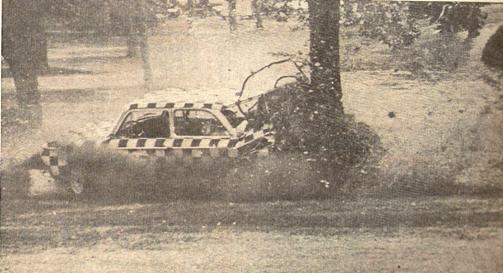 Later, Roy Woods spun to the outside of six, hitting an official's car parked by the trailers; DNF. 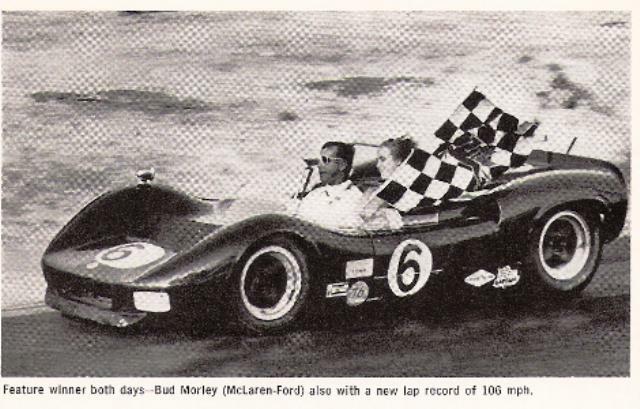 One of the few cars to start on rain tires was McComb, who soldiered on, passing all of the A, B & C Production cars, taking first overall and the Feature Trophy. Ouch ! Karl was uninjured, but the NSU was terminal. Photos courtesy Ponca City News. 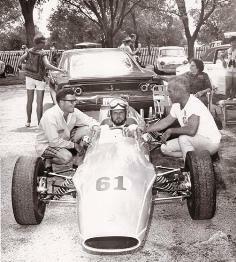 EPILOGUE: The 1969 Ponca City Grand Prix was a special event in several respects. 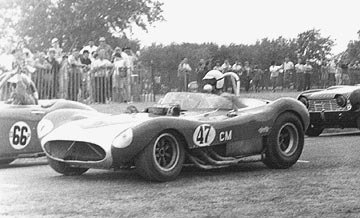 The much hyped shootout between Alyward and Parkhill in their McClarens never materialized, and Alyward’s appearance was the last of the generation of oil barons and their big bore sports racers. Formula cars had started their assent as the premier show. Motor homes began to appear in greater numbers, crowding Ponca’s already small paddock. Showroom stock would become a new, dynamic category. This was the last time ESR would field three cars. 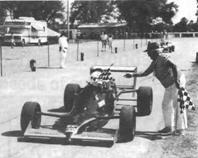 There would be no 1970 Grand Prix due to new safety regulations and SCCA “politics”. You should be justifiably proud of yourselves. The Ponca City National was great. Not only have you found the prettiest locale in the world for a race but the pits were a joy! The shots we took of race cars down the straight with water skiers a hundred yards in the background are going in the front of our album. But the best part was the way the race was run. Every worker we came in contact with was courteous and friendly, as well as helpful. We travel a lot and can honestly tell you that you’re second to none and far, far better than most. From the time we entered the track Saturday and found the welcome note on the entry list and the pit pass already filled out, to the end Sunday and the arrangements made for nameplates on the trophies, we found Ponca City the pleasantest race we’ve ever run. Even the rainbow was perfect! Not one person was gruff the entire weekend! This must be a first—overall record! It’s really easy to get uptight racing and the least bit of sharpness can get to you. But, without exception, every problem (all minor) we came up against was instantly solved by courtesy and intelligence on the part of the region’s workers. Not only was everyone nice, but they performed their jobs with excellence. As we were pitted by the South end we’d really like to recommend the Jones twins who handled entry into the pits. We watched them for two days and they were on top of it every minute. I understand it was the first race they’ve worked—sign them up fast! The high standards of workers in your region was in evidence everywhere, but mostly I can’t stress enough our appreciation of the universal courtesy we met. Our thanks to tech which was thorough and speedy, and to all the various officials who took the time to be nice as well as complete in their answers to our questions. Some regions seem to feel that to be abrupt is the only road to efficiency and end up only with rude and not effective at all. Your race at Ponca proved that politeness, consideration and competence go together. While you couldn’t tell under my Star helmet, I was pretty red faced when you all sang “Happy Birthday” to me - but it was neat and I thank you. You all held up great under rain, thunder and wind and did a great job. Thank you for the pleasure of racing in your region. Put me on your entry mailing list because I’ll be back. Ron La Peer, Chief Instructor of The Bob Bondurant School of High Performance Driving in Santa Aria, California, was born in Charlevoix, Michigan on July 6, l943. This season Ron was driving a Datsun SP 311 production car for the Nissan Motor Corporation throughout the U.S.
Ron was soon to begin campaigning a Caldwell Formula Ford under the auspices of the Bondurant Driving School. 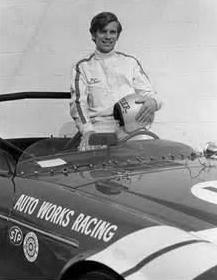 Ron died of internal injuries on July 27, 1969, from a crash at the National races at Lake Garnett., Kansas.